Time is "fast running out" on the talks to restore power sharing at Stormont, Sinn Féin has said. Discussions have been continuing between the Northern Ireland political parties on Thursday. 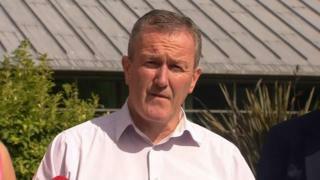 Sinn Féin's Conor Murphy said there was not the "level of engagement needed" to break the political stalemate. However, the DUP's Simon Hamilton said his party was working for the people of NI in both London and Belfast, and he remained hopeful of a resolution. The parties have until 29 June to reach agreement and have been warned that if they cannot, direct rule could follow. The deadline was set by Secretary of State James Brokenshire. "We are seriously concerned given the timeframe we are operating in, given the lack of visibility in terms of the deal that's being negotiated between the DUP and the British government that time is fast running out on this process," said Mr Murphy. "The ability to reach a conclusion to this is being greatly hampered by the approach of the British government." However, Mr Hamilton said the DUP was hopeful that a deal to restore devolution could be reached. "The DUP is able to multi-task and to represent the people of Northern Ireland, both in London and here in Belfast," he said. "The DUP is focused on getting a good deal for the people of Northern Ireland, bringing stability to the United Kingdom as a whole and of course getting devolution up and running here in Northern Ireland." The institutions collapsed amid a bitter row between the DUP and Sinn Féin about a botched green energy scheme. The late deputy first minister, Martin McGuinness, stood down, in a move that triggered a snap election. Will Tories and DUP seal a deal?